This Shouldn't ruin the film for you. I've never been good with summaries. The first shot of the academy front entrance was reused in Police Academy: Mission to Moscow (1994). Capt. Thaddeus Harris: You'll never get away with this, you two-bit filthy scum! Tony: What did he call me? Tony: Ah. Well, perhaps you'd like to leave now. Tony: Shut up, shark bait. Capt. Thaddeus Harris: "Shark bait"? (at around 35 mins) When Hightower throws the Frisbee at Proctor, you can see the wire pulling Proctor up as he flies out of shot. On Network TV versions of the film, 2 scenes are added to fill time. One scene had Captain Harris and Lieutenant Proctor arriving at the hotel in Miami with a goat they had on their airplane. One scene occurs in the Police showcase area where people are trying out various items such as pepper spray, handcuffs, and bulletproof car shields; Tony is seen talking to a friend of his named Larry. 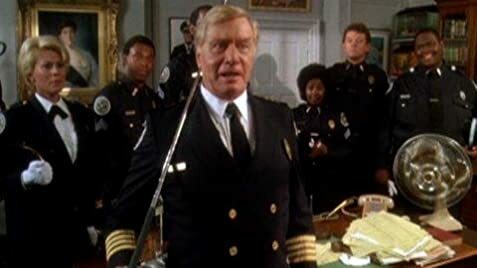 He tries to get Larry to talk Commandant Lassard into giving him the camera with the stolen diamonds in it by telling him a story of how his dead wife had a camera just like the one Lassard's carrying. Feeling pity for him, Lassard is about to hand Larry the camera until Larry asks "is there anything I could do for you in return". Lassard says yes and has Larry take an official Police fingerprint identification test. Larry's discovered to be "a known felon" and he runs off without the camera. Tony and his goons walk casually away followed by Tony getting upset and hitting a police car shield with his hand and hurting it.